The city of Minneapolis has been like a shadow in my life since my father opened the doors to our family's funky brown Mercury Monarch and introduced me to her. As a kid who was born and raised in her clutches, he was loyal and protective of her. I have never fully understood her moods. She could be loving and progressive and then flip and be violent and cruel. We knew she wasn't always fair, with some parts of the family gaining a greater proportion of her graces than others. She was a bosom for some, and a belt or a switch for others, feeding plenty but starving some, too. As the great shadow in our lives, she was the place where I met all of the ghosts that lived under bridges or the tunnels of elm trees, and all of the spots hidden in the cut. During summers I retreated into those shadows; in winter they engulfed me. Real life imprinted itself on my heart in those shadows. It always felt like she favored the ghosts more than us. When we were younger we were all waiting on our moments to step away from our shadows. She wouldn't be the only shadow in my life, and those memories weren't the only ghosts. My relationship to the city brought me to Stillwater, the hundred-year-old prison that blocked the sun from my life for so long. I swear the ghosts here think you are already one of them, they whispered these things into our ears at night. It is easy to become one if you aren't paying attention. When the Twins won the World Series in '91 we skipped school to go to the parade. While the whole city celebrated, what we saw was the underbelly. At 14, we were more conscious of the fights, and the bombardment of local businesses. It was chaotic. It was also exhilarating. As a call to the spirit of our activist parents, we were drawn to the Free Mumia rallies at Cedar-Riverside in the mid-nineties. I didn't understand then the politics of confinement, or how it would later be such a central part of my life as I took my place in Minnesota's massive prison population growth. We half-heartedly stumbled into a movement that would become the major themes in ours and our families' lives. These themes started in the nightmares I had in the old Hennepin County jail and courthouse with the copper-green roof. It was old and cold and you could flush an entire county blanket down one of those toilets. On Sundays and Wednesdays it smelled like orange peels and bologna. Some couldn't eat for days when they came in; others ate everything. Men came in and tried to sleep off the DTs and bargain a way out. Some men carved their names in holding cells so they could recognize themselves every time they came back. Everybody had a version of the city. They told stories forever: about the Southside and the Northside, and every other city we shared those cells with. They talked about lives in juvenile detention and trip after trip to jails and prisons, and wore the armor of men that gave up on conventional lives long before. I slept on a bunk that generations had before me. For as many men as it housed, there were so many more ghosts that spoke to me in those dreams. For as much as I just wanted to get out, they assured me it was only the beginning. When I went away to prison, like so many other kids of the generation that grew up during that period of the late '80s and through the '90s, many of my friends got their allegiances to our city tattooed on their bodies: Southside and 6-1-2; names of parks and neighborhoods and streets; outlines of the state of Minnesota, with the city's skyline across their backs. The themes often crossed color lines and criminal affiliations. They were wearing in permanent ink what my father was showing me when the door swung open on the Mercury, and the expanse of Powderhorn Park was shown to me. I always planned on getting my own tattoos with my lifelong allegiance to her on display. But when it got time to put her on my flesh, it just didn't mean as much as I once thought it did. Me and my friends have these conversations about our histories and the ways we remember certain people or places. We speak of how a guy was "a shooter," or "had hands" back in the day; how someone else used to "get money." They are the versions of people we hold onto when the flesh and blood versions of these people have come to disappoint us—just as we have come to disappoint ourselves. We hold onto their ghosts instead. I have come to understand Minneapolis as a home for coalitions of good people working on behalf of other people, but I also recognize the wealth and educational disparities that so truly exist, that are hallmarks in the lives of the people I have grown up with in prison. Those disparities are themselves ghosts that just haven't seemed to ever go away. The city has always been that shadow for me. I love my city even though I wasn't always loved back. She gave me a place to say "This is where I come from." It was where I met the people that would shape my world. 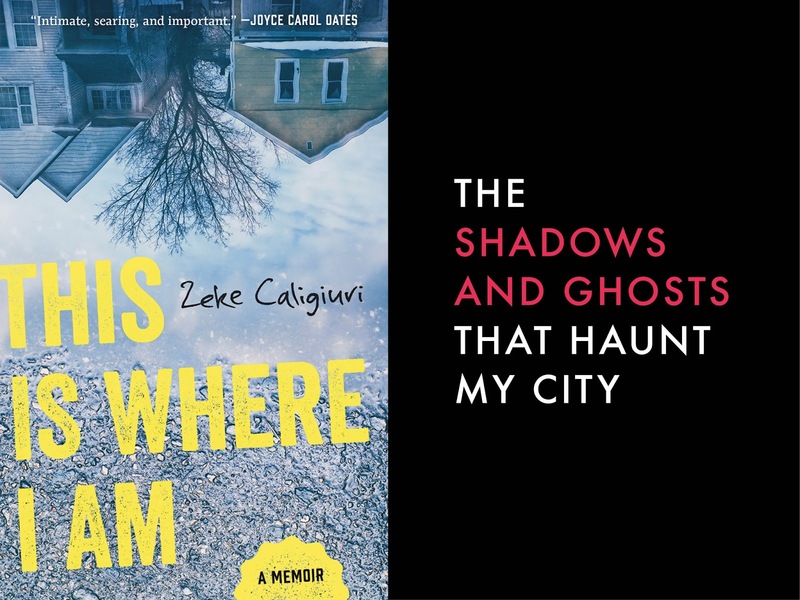 Their ghosts hover through the streets in Starter jackets and tattoos of the skyline on their necks and backs. They are now in their late 30s or 40s fighting with younger versions of themselves with different names and different costumes over the city's propriety to them. I wrote my book because I am sure there are still ghosts of myself moving through South Minneapolis. There is a ghost of myself moving through the prison in Stillwater as well. Much in the same way the phantoms of our earlier ideas and expectations still linger about who we are and what the city is to us: a loving mother or an abusive foster home; a first love or a girl that watched you get beat up at the park; an old friend or an unresolved beef; the place where you were most free or a prison where you most were not. 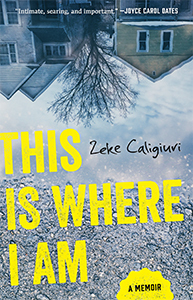 Zeke Caligiuri is author of This Is Where I Am: A Memoir. Caligiuri is the recipient of several awards through the annual PEN Prison Writing Contest. His work has been published in the collection Prison Noir, edited by Joyce Carol Oates; From Education to Incarceration: Dismantling the School-to-Prison Pipeline; and From the Inside Out: Letters to Young Men and Other Writings. He is incarcerated at the Faribault Correctional Facility in Minnesota, where he continues to write. On Bobby Vee, a great man to the core.